Slate long been used as a roofingmaterial, it has not lost its popularity in our days, all the more so with every work on the roof can handle yourself, if you know how to cover a roof slate. longer service life (35-40 years). The roof of slate is suitable for any design of buildings, looks beautiful and is a long time. fragility: the careless transport or careless handling can break. Slate sheets release 6, 7 and 8-wave. 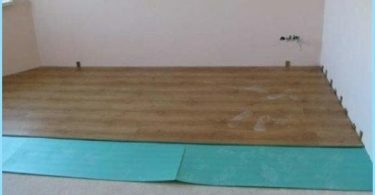 The standard length of 1750 mm sheet width depends on the number of waves shown in the figure, the thickness of 5.8 to 7.5 mm, the wave step 150 or 200 mm. The height of the ridge (waves) is 40 to 7 mm and 8 mm and 54 wave 6 wave plate. Fixing the slate roof is made bycrate, which is used for 60x60 mm bar, roof boards 60 mm thick and more. This is due to the increased load of roofing material on the truss system. The distance between the bars of the lath is made to the slate lay at least two of them with a margin of 15 cm on each side. For roofs of slate recommended slope angle of inclination of not less than 22about. For uni-directional and pitched roofs anglesthe inclination can be less, but require reinforced sheathing. The principle of amplification for different angles of inclination of the ramp is shown in the figure. Under the slate put a vapor barrier, especially if you plan to heat insulation of the roof. Planning works with his hands, it is importantcorrectly calculate the amount of slate on the roof, so that the material was enough and there was no extra expenditure. 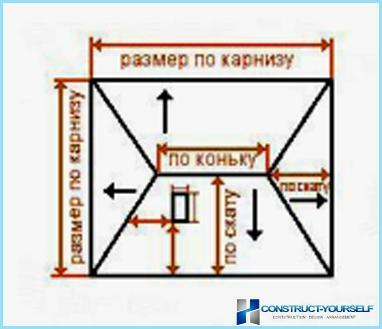 For a person who is familiar with the fundamentals of geometry, such calculations are not difficult. 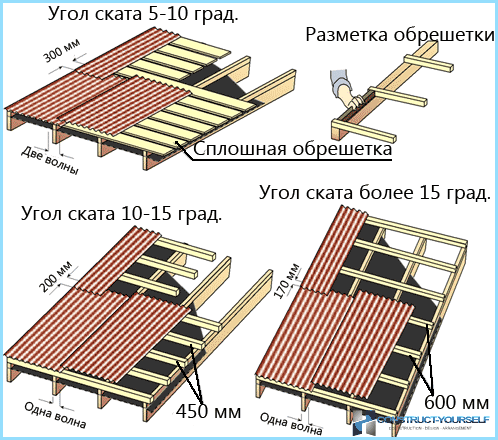 Roof with one or two ramps need to measure the width and length of the house, the angle of slope. 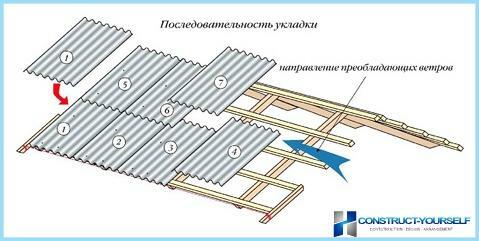 received and the number of rows of sheets in a row is multiplied to obtain the number of sheets of slate on one skate. If the roof gable, the result is double. For hipped roofs rays geometrically calculated area (the area of ​​triangle and the area of ​​a trapezoid, as shown in the figure), divided by the area of ​​a sheet of slate, and add 15%. Important! Buying slate, should pay attention to itintegrity. Slate sheets should be shifted paper or film. Keep sheets need on a flat surface, to protect from moisture and sunlight. Before working on the deviceroof slate, prepare all the necessary tools and flat area, which will cut the sheets and drill holes in them. The site must be such that a sheet can be approached from either side. For the installation of slate roofs will need: hammer, slate nails or self-tapping screws, drill, Bulgarian or hacksaw, a dust mask, paint for slicing ladder stepladder, ladder, ladder, rope, metal hooks. 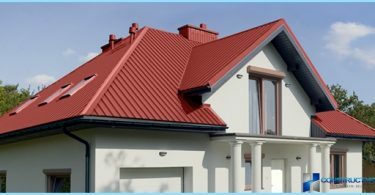 For those who are planning to do the roof with his hands,often the question arises, how to raise the slate roof. This is done with the help of ropes and two hooks. Leaf mesh bottom two hooks, to which is tied a rope. Ropes with slate sheet is pulled to the roof. You can submit lists of hands using a stepladder, if work is done by two or three people. Before you lay the slate on the roofunpainted sheet may be impregnated with a water-repellent composition, an acrylic paint, or the aqueous dispersion of the alkyd paint when required. Painting closes microcracks, making slate smoother snow in winter time rolls easily with him. Slate, depending on the ambient temperaturesubject to deformation, so between the nail and asbestos must be a small gap. Make it by drilling holes in the ridge slate 2-3 mm larger diameter than the nail. You can drill these holes and the place of installation of sheets, if so it will be more convenient. Drain set before the start of roofing. Slate sheets begin to lay the bottom row. Slate wave overlaps should be at the prevailing direction of the wind, the wind is not blowing under the slate and did not try to lift it. Sheets sawn hacksaw or grinder. The sections are colored paint to asbestos does not crumble. Attention! Drilling and cut sheets of slate need a respirator, especially if you use a drill and grinders. Place the cutting is recommended to wet. Asbestos dust is harmful to health. Fixing blades to the roofing materialcrate - an important step, which depends on both the strength of the roof and the integrity of the slate in the operation. It should be borne in mind the seasonal strain and progress of roof systems and slate, the increased load on the roof in the winter. Fixing the slate roof to carry the crateslate steel nails with a head diameter of 14 mm or with screws. Slate nail head and share a metal washer and a lining of rubber or other elastic material. Slate nail conventional hammer. The nails are inserted into pre-drilled hole and hammer is not the way, but did not move to the slate. 8-wave slate slaughtered in the 2 nd and 6 th wave of the interface, 7 wave - the 2nd and 5th, respectively. Vertical leaf nail in two places to the crate. The distance from the edge of the nail to the canvas no less than 15 cm. So move to the ridge. Important! Nails are bent by the lath if they are long, it is not recommended. It is better to cut to the desired length. If there is a furnace on the roof is requiredarrange to bypass the chimney. For the chimney on the roof slope abutment arranged differently depending on whether or not there is waterproofing. In the presence of waterproofing contiguity of steel plate mounted under the slate and film, and in her absence made so that the upper edge of the steel sheet was under the slate, and the lower the ramp - over it. Driving junction device shown in Fig. The device skate - the finishing stage of the roof assembly. Horse protects the roof from water, provides ventilation, is a decorative element of the roof. Skate roof slate made of galvanizedsteel or finished ridge elements in the color of the sheets. Cut out a sheet of galvanized steel and the desired width in the bend Bending machine or by hand, to the bending angle was a little smaller than the angle between the sheets rays. To fix the ridge using the same nail. How to install skate, shown. Installation of a slate roof - it is not difficult, it is aforce someone who is familiar with a hammer and a saw, has enough time to work. Wave slate is 170-260 rubles. per sheet, that is from 90 to 135 rubles. / m2. 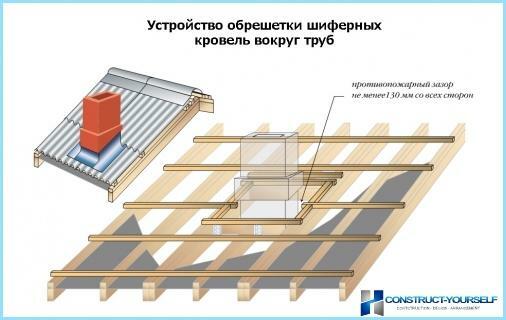 On average, taking into account the fixing and waterproofing materials, price of the roof with his hands will cost about 200 rubles. / M2 . When the time to cover the roof with slate with his own hands is not enough, you can hire a team. The cost of laying the slate will be from 150 to 300 rub. / M2. 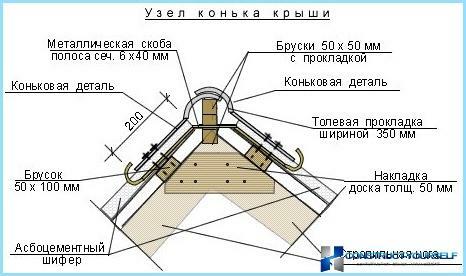 If you need to install the truss system, heat, steam, waterproofing, lay the slate, the work will cost from 700 to 800 rub. / M2 . Providing a consistent and thorough performance of works slate roof will be long and reliably.